The technological revolution may take more or less time to arrive, but it will reach all sectors eventually. Now that electronic banking is an established concept, the moment to transform the bank branch has arrived. A change in form will always require a change in substance. Banks have started to progressively abandon the traditional layout of its branches in favour of better organised designs which are more client-orientated. This is not only on an aesthetic level, but in the creation of spaces that go a step further in interacting with clients. Making use of the advances in technology will be vital in leading this change. The eruption of Omni-channel technologies has revolutionised the way in which many banks communicate with their clients. Among other advantages, these solutions enable the offline world to analyse results of the digital environment. They provide branches with valuable data to know more about their clients, to verify the efficiency of their marketing strategies, increase their ROI, and above all, to create unique experiences for their customers. The Omni-channel concept has been confirmed as a necessity for the banking sector. The latest Global Consumer Banking Survey by EY suggests that 44% of customers admit that they do not trust a bank that has no physical branches, and 66% consider it very important that the bank is active online. Despite the boom in digital communication, the online world cannot consider itself a substitute for the offline. Both channels must complement each other and work side by side in order to offer a united and enriched experience to the customer. The gap between banks that are proactive in improving the client experience and those that aren’t, is constantly widening. Technology is the key to optimizing and creating value in the bank’s communication with its clients, as well as obtaining a competitive advantage differentiating themselves from competitors. We are talking about bank branches that remind us of a retail space, where it is necessary to respond to the needs and behaviour of today’s clients, looking to improve the purchase experience of clients inside the branch as well as staff. Banks do not compete solely with other banks. Digital Signage is a perfect tool for the banking sector thanks to its versatility and flexibility in renewing messages. In fact, 60% of financial institutions already use them to boost brand awareness, advertise products, differentiate themselves from competitors, and unite all channels of communication. 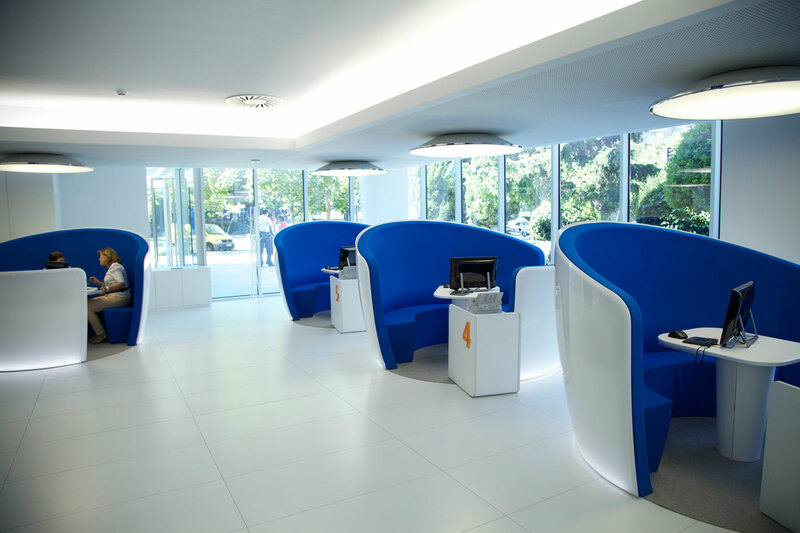 Furthermore, 95% of these bank branches confirm that they are satisfied with the implementation of digital screens, an action which has resulted in an important saving in the publication and distribution of promotional material within the network of agencies. If we equip this technology with a video analytics system, the managers of each branch will be able to know how clients have reacted in each campaign. How many people saw the advertisement? What content is more attractive? How does it work on each demographic segment? The flexibility of this system allows easy message updating, at all times (even remote access), and adjusts to the target segment. 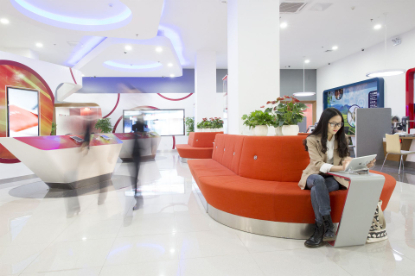 For example, if the analysis shows that between 10am and 12am, 80% of clients in the branch are of a specific profile, it is a good idea that the content broadcast via digital signage during that timeline fits the language and needs of that segment. Likewise, there are also digital signage devices with facial detection software that offer a completely personalised and appealing experience at the point of sale. 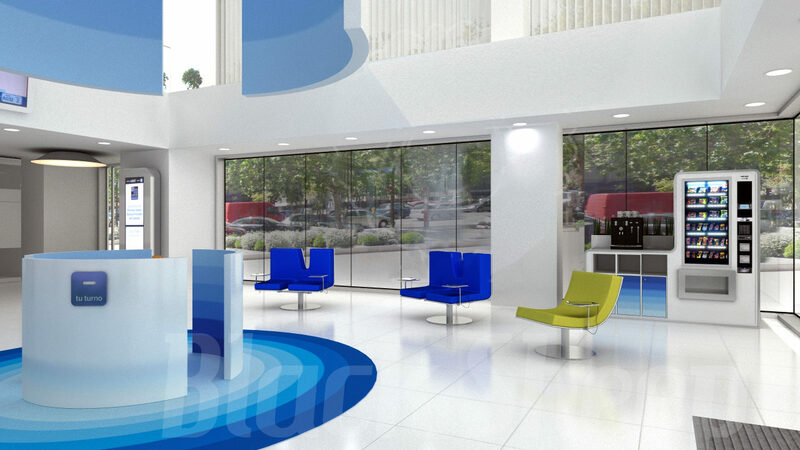 They provide the branch with a look & feel that is both innovative and cutting-edge. These screens project a message based on the age and gender of the person who is in front of the monitor or LED screen.